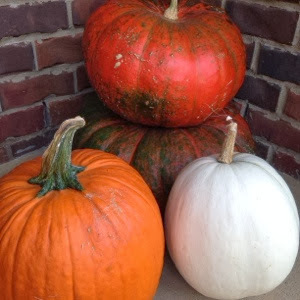 Last weekend we went to Tate Farms and bought our annual provisions of pumpkins and mums. We couldn't wait to get home and let them find their homes on our porch. As I jog through the neighborhood in the early morning hours I love seeing all the houses dressed up for autumn. Nothing too fancy, but I we love it. 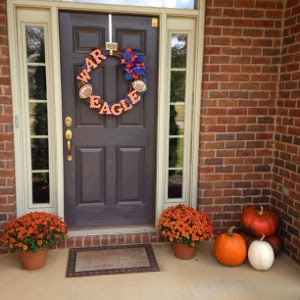 And nothing says fall like a "War Eagle" wreath. I love non-traditional pumpkins, like these "cinderella" ones stacked up and the white one in front. 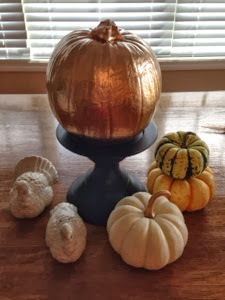 I have seen in magazines and on pinterest where people monogram white pumpkins with either paint or some kind of cool vinyl cling. I had aspirations of that...but it is just not going to happen...luckily it looks pretty just sitting there plain and white. I did dress this little guy up. The pumpkin on the candle stick is real...and just a pie pumpkin I picked up at publix a couple weeks ago. I think I saw this idea in a magazine...but I just took some gold spray paint and gave him a little coat. Super easy and super cute. And while I was on a spraypainting kick (during a certain someone's naptime the other day), I got out this wooden monogrammed "E" that Emily gave me at Christmas (last year? year before?....it's been a while...oops) and gave it a coat of green. Green goes so well with everything...it can be fall, christmas, spring, summer...and it still works. 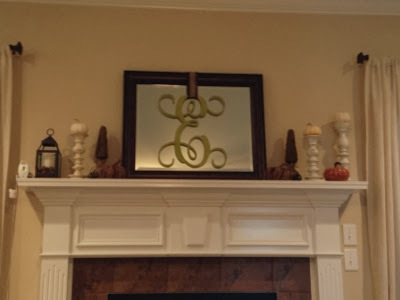 I wasn't sure where I wanted to put it and finally settled on the mirror above the mantle. I am so in love with how it came out. Thanks Emily! Even though it is a little (lot) belated.